On 24 July 2013 late afternoon NATO’s Standing Maritime Group 2 (SNMG-2) arrived in Istanbul. The group was in the Black Sea since 5 July and visited Bulgaria, and Ukraine and conducted training with Bulgarian and Romanian naval units. I was invited to the press conference on board of SPS Blas De Lezo on 25 July 2013. It was my third visit of a Spanish warship but my first press conference so it was quite an interesting event. Rear Admiral Eugenio Diaz Del Rio is the current commander of the Maritime Group 2, for a period of a year starting June 15th 2013. 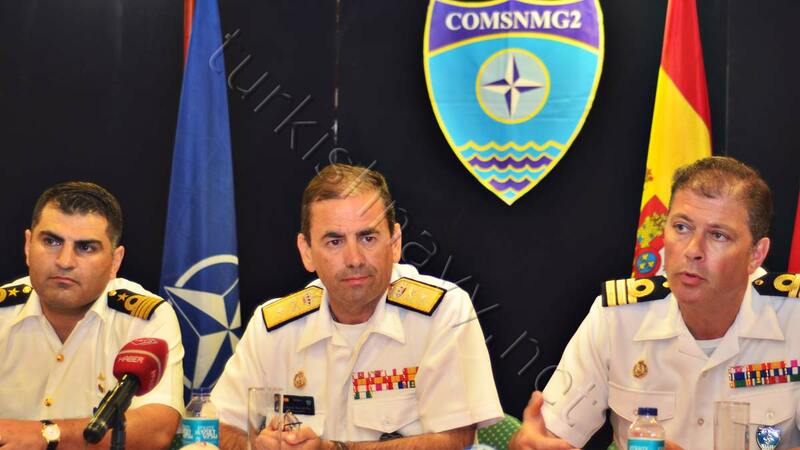 He, with the commander of the SPS Blas De Lezo Commander Fernando Alvarez Blanco and the commander of TCG Salihreis Commander Levent Bingöl answered the question of the press. Real Admiral Diaz Del Rio explained that there will two different stages during his command. In the first stage SNMG-2 will remain mainly in the Mediterranean and in the Black Sea and will support NATO’s Operation Active Endevour and take part in naval exercises Doğu Akdeniz organized by Turkish Navy, Briliant Mariner/Mare Aperto by Italy or Naias by Greece. In the second stage in 2014 will relived SNMG-1 in the Gulf of Aden and will take the responsibly of the NATO’s anti-piracy operation Ocean Shield for the first 6 months. He also told that the current composition of SNMG is going to change in late August as more warships will join the group. Upon my question how he would elaborate this the Black Sea cruise of the SNMG-2 he told that being in the Black sea was interesting as a member of the Spanish Navy he did not had many opportunities to be there. The training of SNMG-2 with the Bulgarian and Romanian naval units was in his opinion very good and helped these NATO navies in gaining the experiences other older NATO navies already have. He also praised the support of Turkish Navy. SNMG-2 was refueled by Turkish oiler 3 times when it was in the Black Sea. Real Admiral Diaz Del Rio informed that during his tour as Staff Operations Officer at NATO’S Standing Naval Force in the Mediterranean (STANAVFORMED) in 2000 he was stationed on board of a Turkish ship and had a very good working relations with Turkish Navy. The admiral answered my question whether a plan at NATO level or at national level for Spain existed to position AEGIS platforms such as the frigate Blas De Lezo on the Black Sea, to support NATO initiative to provide a BMD for Europe by saying that NATO was to provide command and control for the BMD system components and every participating nation was going to provide their equipment accordingly. Upon a question how it feels to have an admiral and his staff on board the commander of the SPS Blas De Lezo Commander Fernando Alvarez Blanco said that Real Admiral Diaz Del Rio, was his boss in their previous tenure and they have been working together for a long time. Commander Blanco also told that Turkish delegations have visited the frigate and they have been extensively briefed about the working of the AEGIS system. He also told us that the AEGIS system was working well in coastal/littoral Sea such as the Mediterranean or the Black Sea especially if you have a previous knowledge of the area and the expected threads. I participated in training Spanish Sailors on AEGIS. They were very capable students.